Let's be honest - some wedding days are going to have rain. It might ruin your outdoor wedding or you might have guests willing to sit through it. For this couple, they were able to delay the start of their ceremony just a few minutes and keep it outdoors. Family formals and couples portraits went off without a hitch and without any rain. 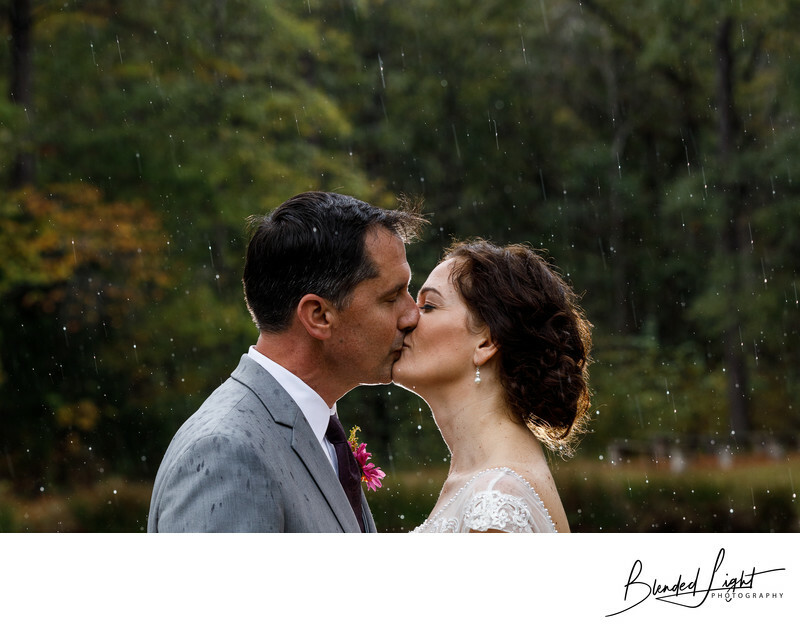 But when the rain began to gently fall again, I knew it was an opportunity to create something a little special and telling from their wedding day. Yes - the couple stood in the rain for a few seconds and got slightly dampened while I got the shot. Yes, I stood in the rain for a couple seconds while I got the shot, along with all my gear, and got a little wet. But this is one of those times where the end justifies the means. With a touch of flash magic, the raindrops turn to diamonds as the couple shares a kiss. This is a great example of taking the weather you're given and creating something special and different with it. A lot of photographers and couples will run inside to the warm cover and comfort, fearing getting wet for a couple seconds. But the rain is part of your wedding, so I always suggest trying to embrace it - within reason. Of course you'll likely get a touch wet, unless you can find the perfect doorway to execute this in. But, honestly, you'll dry off. Not to mention, folklore tells us that rain on a wedding day is a sign of good luck and a lasting marriage. It rained on my wedding day and 19 years yet, I'm still happily married. Doyles Vineyard is naturally situated to be an outdoor wedding venue. The venue has a small chapel (a former doctor's office built in the 1870s) with bench seating set in front of the pond between the house and chapel. The winery house itself has a large deck overlooking the pond with ample space for parking. The courtyard between the parking area and the winery is the perfect location for that all important and most cherished wedding day ritual - the reception. The Vineyard also offers couples a tradition that I have not seen at any other venue I have shot at. But, to find out what it is, you'll have to contact them! With rolling hills and open areas, there's nothing but opportunity to create your family and couple's portraits with style, tradition and grace. The wooded backdrop provides a lush green setting for those images and looks equally gorgeous in summer or fall. If you are looking for a vineyard for your wedding located right here in the Triangle area, Doyles may be just what you are looking for. And if you are looking for that special someone to capture all the events and moments of your day there, well, I'd like to nominate myself. If you would like more information about my services, head over to my pricing page or shoot me a email and I'll be glad to get back in touch with you quickly! Location: 8913 NC Highway 751, Durham, NC 27713. 1/200; f/5.0; ISO 400; 88.0 mm.